As I was clearing my bed from the daily accumulation of books and primary paraphernalia, I heard a sudden urgent cry coming from Beth's room. Experience has taught me that if I leave it long enough, one of two things will happen. Either she will just fall back asleep, or, more often than not, she will wake herself up and get mad, which is a much harder state to try to coax her back to sleep. With a sigh I turned off my light and went to Beth's rescue. I didn't want anything that could possibly prolong her lingering between sleep and consciousness. I quietly opened her door and as the faint light from my bedroom lamp spilled across her floor, she stopped mid scream to say "Hi." It may have melted my heart a little, and made me laugh a lot. I went into her room and noticed that it was too warm. Apparently she had been fiddling with the space heater during the day and had turned it up too high, which was the reason she was awake. I turned it back to the usual temperature, and turned to the crib. She was standing on her tippy-toes, bouncing in the crib, arms extended towards me, greeting me happily over and over with "Hi." I scooped her up in a great big hug and just held her. Part of me really wanted to be in bed sleeping. The other part was desperately glad that she had awakened because I love to cuddle her. We walked around her room for a little bit, me humming and bouncing her, while she smiled at me and rested her curly head on my shoulder. We glided over to the window to look at the moon glow spilling over the yard, reminding me why we named this place Moon Hollow. For the brilliant moon-white glow that illuminates our yard and paints it like a fairy land. As we were imagining imps and fairies dancing through the bird bushes, we heard a train. It was fun to see the cars rushing past, throwing shadows across the lawn. Beth let out a sweet and tired sigh, and I asked her if she would like to go back to bed yet, and she said "No." We walked around the silent dark house, me whispering softly in her ear, telling her stories and my hopes and dreams for her when she grows up. Secrets. After a few minutes, I again asked if she was ready to go to sleep. By this time I was beginning to yawn something fierce, so we went back to her room where we rocked in her rocking chair and I sang her songs until I was hoarse. After each song, I asked her if she was ready to go to sleep yet. She always answered in the same way. And so I smiled and continued holding her and rocking her, feeling the weight of her head on my shoulder, her curls rubbing my cheek, and eventually my head nodded. My eyes drooped, and I think I may have fallen asleep in her antique rocker, creaking and sighing with every movement I made. If I did fall asleep, it wasn't for long. I gave up on asking her and simply got up and walked over to her crib. As I was moving to lay her down, she wrapped those darling little arms around my neck and squeezed with a power I would never have suspected, and said firmly, "No." 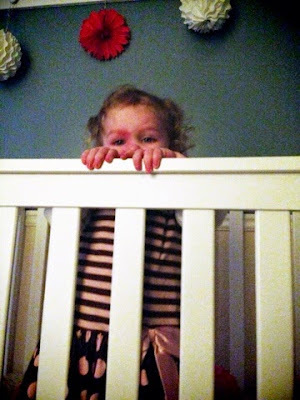 I kissed her cheek, untangled her arms from about my neck, and gently laid her down in her crib. I gave her her teddy bear, patted her back, and sneaked out. As I was closing her bedroom door, she again said, "No." I think she may have learned a new word today. Awww! !1 What a sweet story! At least it was just a no and not part of a humongous meltdown temper tantrum!!! PS - It's been too long since we talked!! !